Chilliwack/Cultus Lake – It’s been a long time coming. In fact, the first in-clings that the old Vedder bridge, first built as a temporary Bailey Bridge in 1947, would be replaced, came as part of City Council discussion in December 2011. In the process, Chilliwack City Council came up with their share of the money that would be part of a three way government project with the Feds and Province also putting monies into the pot. The challenge… waiting for the other two parties to cough up the cash. Note the timing for Chilliwack Hope MP Mark Strahl. There is a Federal Election in October and early presents look good. The total cost for the new Vedder Bridge comes in at $12,563,750. Both Ottawa and Victoria kick in $4, 187, 916 with the City picking up $4M including the balance. This will be a two lane steel plate girder with room on both sides of the bridge for pedestrians and bikes. Yes, there will be a roundabout to handle traffic onto the bridge, into the Vedder Trail parking and access to Chilliwack River Road. The City Website info page on the bridge can be found here. Federal Liberal MP Candidate Louis DeJagger questioned why Tyson Road wasn’t extended and a new bridge crossing over the Chilliwack River couldn’t be built there. According to all the politicians who were there, the cost would be three times what it is now and that would put it out of reach for the Federal Small Communities Fund, from which Ottawa is paying their share. The bottom line is that construction (after the tendering process) will start sometime in 2016 and the expected completion date will be the Fall of 2018. The new Bridge will be built along side the old one (similar to the recent Port Mann Bridge project) and when the new one is running, the old one will come down. So what about the parking for the Vedder Trail and the dog park? It will simply be shifted over but not eliminated. Fraser Valley will benefit from the replacement of the Vedder Bridge in Chilliwack and improvements to the Parkview Water System in Cultus Lake thanks to joint funding from the governments of Canada and British Columbia through the Small Communities Fund. 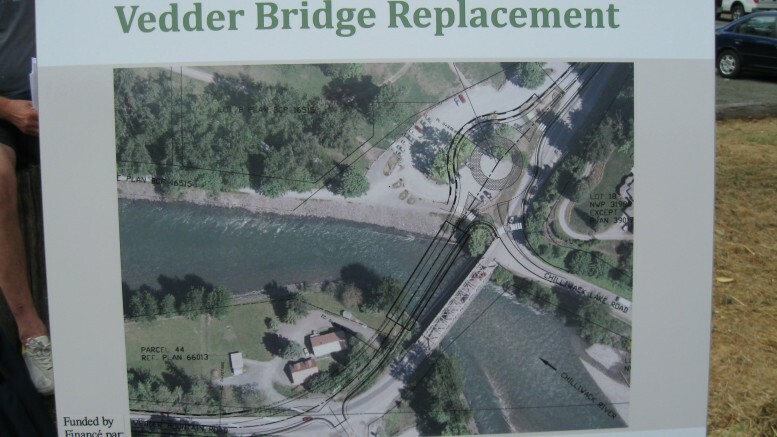 In Chilliwack, the Vedder Bridge project will replace the existing two-lane steel thru-truss bridge over the Vedder River with a new two-lane steel plate girder bridge with shoulders and multi-use pathways. Both the north and south approaches to the bridge will also be updated. Additionally, a new single-lane roundabout will modernize the junction of Vedder Road and Chilliwack Lake Road. Collectively, all of these upgrades will improve traffic flow and help to ensure safer commuting. In Cultus Lake, residents will soon have relief from poor water quality, low water pressure and firefighting challenges. Part of the funding announced today will permit the community to upgrade the Parkview Water System. The work will result in approximately 70 residences having access to more reliable, clean, potable drinking water and fire protection. When completed, the system will produce a volume of potable water that meets regulatory requirements and is sufficient to allow neighbouring subdivisions to also connect to the system. The projects that were announced are among 55 recently approved in British Columbia that will collectively receive more than $128 million in joint federal-provincial funding under the Small Communities Fund. These projects represent important investments in municipal infrastructure that maintain safe, healthy communities. Once complete, the work will significantly improve key municipal services for residents and help boost regional development. Through the Small Communities Fund, the governments of Canada and British Columbia are working in partnership to provide funding for priority public infrastructure projects that deliver on local needs in communities across the province that have fewer than 100,000 residents. These investments support job creation and economic growth, thus sustaining a high quality of life in small communities across British Columbia for years to come. The Government of Canada will provide up to $4,187,916 through the Small Communities Fund for the project. The Province of British Columbia will contribute up to $4,187,916 to this project. The City of Chilliwack will be responsible for all remaining costs of the project. The total estimated cost for this project is $12,563,750. The Government of Canada will provide up to $63,250 through the Small Communities Fund for this project. The Province of British Columbia will contribute up to $63,250 to the project. Fraser Valley will be responsible for all remaining costs of this project. The total estimated cost for this project is $189,750. The 55 projects approved for funding in British Columbia under the Small Communities Fund so far include 24 drinking water projects, 22 wastewater projects, four major roads projects, two disaster mitigation projects, two brownfield remediation projects and one solid waste management project. To learn more about the Small Communities Fund, please visit: www.infrastructure.gc.ca/plan/sc-cp-eng.html. Learn more about the Small Communities Fund at work in British Columbia: www.gov.bc.ca/smallcommunitiesfund. For additional information on the New Building Canada Plan, visit: www.infrastructure.gc.ca/plan/nbcp-npcc-eng.html. Be the first to comment on "Chilliwack Gets A NEW Vedder Bridge – Cultus Lake Receives Water Improvements"